Seriously? OMG! WTF?Fast Food Archives - Seriously? OMG! WTF? The good news is that Carl’s Jr. is selling a cheeseburger with CBD oil on 4/20 for $4.20. The bad news is that they are only selling it one store in Colorado. 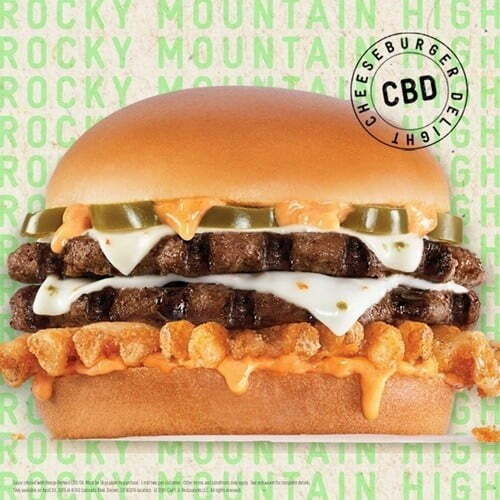 According to KUSA, The Rocky Mountain High: CheeseBurger Delight (CBD) includes two 100% charbroiled beef patties paired with Carl’s Jr. signature Santa Fe Sauce infused with CBD, pickled jalapeños, pepper jack cheese, and Crisscut fries to give the burger the extra crunch– all between a premium bun. If you live near 4050 Colorado Boulevard in Denver, then stop by to try it anytime after 6a this Saturday until supplies last. I hope it does so well, they make a nationwide thing because I so want to stick my teeth into it. Doesn’t it so yummy? You don’t need the THC to get you high after eating that. Burger King got into the coffee business and they are charging just two quarters for a cup of Joe. 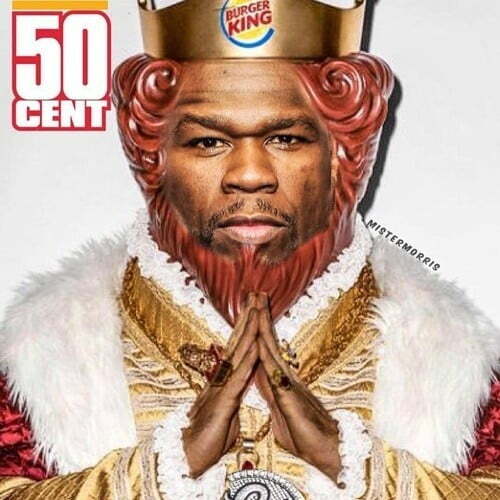 When 50 Cent heard about that, he thought it was in honor of him. You know what, they should make him their mascot. I know you are saying but clowns are McDonald’s thing. Sorry, it was too easy not to go there so I went there! You know those Chick-fil-A ads with cows saying they prefer that fast food joint over the ones that sell burgers made out of them? Turns out it is true. On Saturday, Michael and Athena Hopkins weren’t mooving because they were stuck in traffic waiting for a cow to cross the road in Noblesville, Indiana. Where was the bovine going? Chick-fil-A, of course. If the cow was a chicken, it would have crossed the street to get away from that restaurant. So now we know why the cow crossed the road, but we still don’t know why the chicken did it. BTW if I were Chick-fil-A, I would give this couple a lifetime supply of your chicken sandwiches. They did a great marketing campaign for you and you did not even have to pay for it. Did Burger King create the saddest fast food commercial? Are you in labor right now? Can you hold it in until 6:30p EST today aka after the kick off at the Super Bowl tonight? Then you can get free pizza for a year from Pizza Hut. That is not all, although that is pretty awesome, you also get two tickets to next year’s game. Transportation and hotel not included. All you have to do is tweet @PizzaHut with the birth announcement of your brand new bouncing football with #PizzaHutSpecialDelivery to be eligible for the free prize. Let’s be honest, what new parent doesn’t have to worry about making dinner for a year? To me, that is better than the tickets, but they are sweet like the pineapple on a Hawaiian pizza. Who likes those anyways?